The Universe started with a big bang 13.7 billion years ago and has been expanding ever since. A few hundred million years later, the first stars and galaxies started forming. A powerful way to study the evolution of the cosmos is via the chemical fingerprints left by the nuclear reactions that take place in stars. Recently, many challenges to our understanding of the early universe have spawned from observations of the oldest stars in our Galaxy, and the 2011 physics Nobel prize was awarded to using stellar thermonuclear explosions as candles for cosmological distances. Satellites (ESA Gaia, XMM-Newton, INTEGRAL) and many ground-based spectroscopic surveys (Gaia-ESO, ESO-PESSTO, Pan-STARRS) will bring new discoveries. In parallel, world-leading nuclear physics experimental facilities are located across Europe; among them GANIL (France), the first underground laboratory for nuclear astrophysics LUNA (Italy) and the accelerator facility FAIR (Germany), one of the largest research projects in the world, currently being built at GSI. 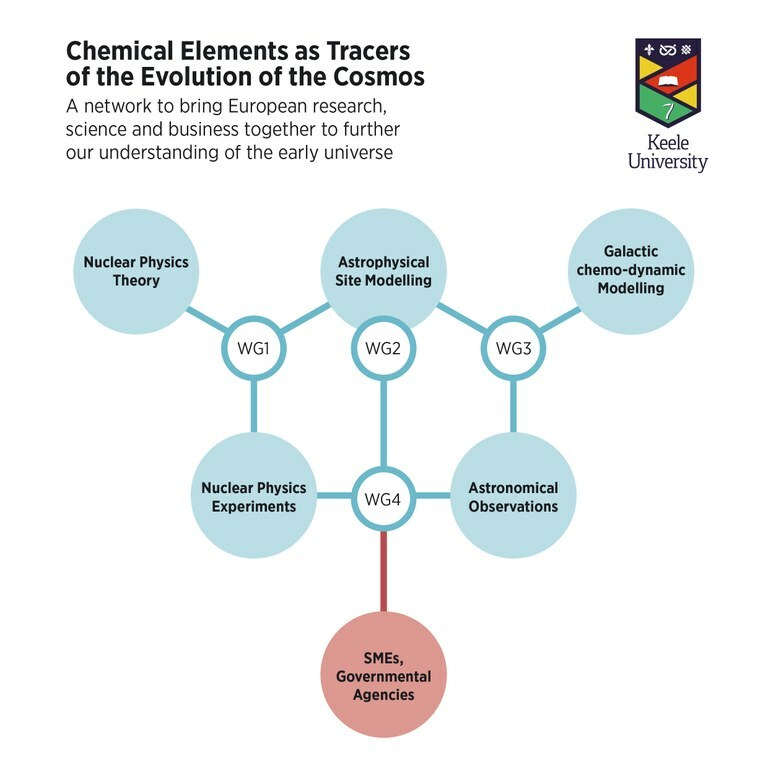 To maximise the scientific and innovative return of these huge European investments it is essential: to coordinate research efforts in astronomy, astrophysics, and nuclear physics; to build pan-European inter-disciplinary bridges between these disciplines; and to link this blue skies research with SMEs who can provide the technological tools required for the exploitation of data, software and techniques and in return join the innovation cycle. These are the goals of our ChETEC (pronounced [ketek]) COST Action, which stands for Chemical Elements as Tracers of the Evolution of the Cosmos. The Action will also train a new generation of European scientists providing inter-disciplinary expertise and knowledge-transfer skills with the aim of strengthening the Innovation Union. The ChETEC Action aims to tackle the following key open questions and is organised in four working groups (WGs) as shown in the flowchart below. More information about our Action and activities (STSMs, workshops, ...) can be found in the various tabs. The Memorandum of Understanding can be downloaded from the COST official ChETEC webpage.